Today, I am joining Kari and Kijsa's Designing For Your Life party. So without further ado, welcome to my bedroom!!! Our bedroom is my absolute favorite room in our home as it is my sanctuary, my haven. It is where I retreat to at the end of a long day. 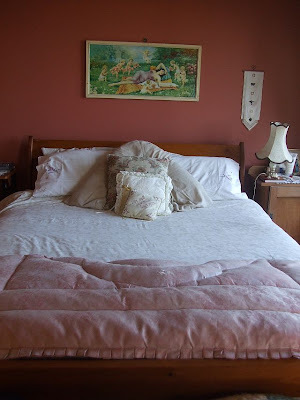 I love our bed, I love clean, crisp cotton sheets, sun dried, ironed and sprayed with lavender water. I love our electric blanket and tucking the pillows around and behind me. This room is where I read my books and magazines each night, watch TV, blog, write, plan and dream. 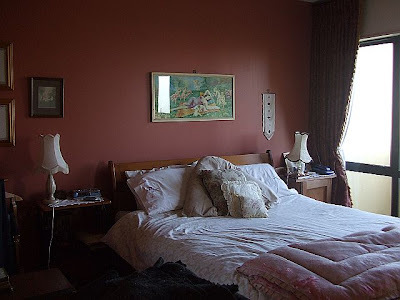 It is where Babes and I lie and talk, where The Princess will join me on Saturday mornings for stories in bed while Babes brings us our breakfast. It is the calm in the storm! Our bedroom is the one room in the house that is always tidy, no toys, no daily debris! 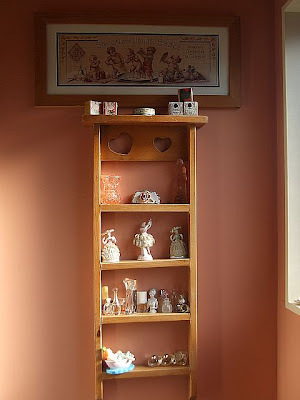 It the where I have my most treasured items on display and it is the room where most of my cherub collection lives. It is decorated in a rich romantic style as you will see. 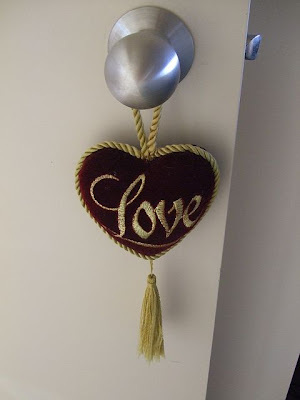 This hangs on our bedroom door. Our bed, my night table is on the right. On the floor by my side of the bed is a stack of my magazines and the books I am currently reading. There is a little enclosed balcony off our bedroom, reached through a sliding door. 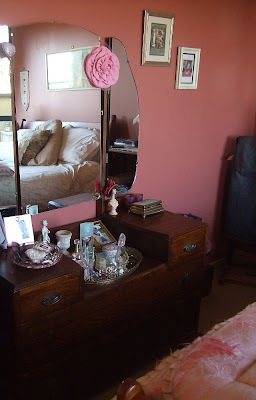 A vintage and somewhat tatty, but still very pretty, pink feather eiderdown sits on the end of our bed and at the very foot of the bed is my Granny's glory box. My dressing table has special treasures on it given to my by loved ones and photos of The Princess. 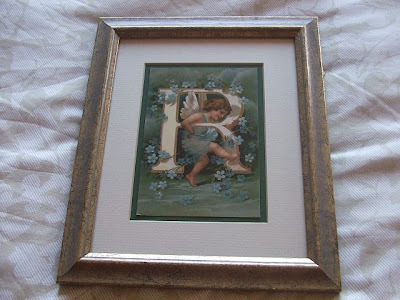 One of my favourite cherub pictures is this 'R' found in an op shop (thrift shop) in Melbourne, Australia. I love this little vintage French looking table tucked into a corner. It has more cherubs and a pink washbowl and pitcher given to me by my very first Rose Room customer. My little ensuite is off our bedroom. Babes doesn't use it so I have my own very girly bathroom. 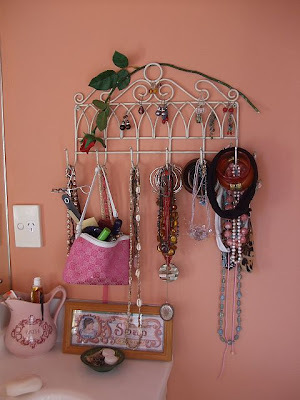 This is to the side of the vanity unit, I like to have my jewellery and make up on hand! 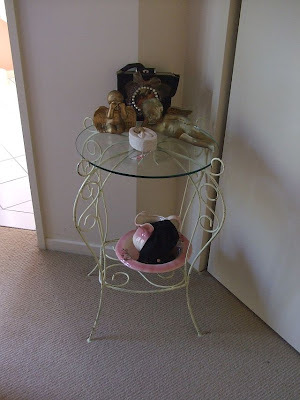 This little shelf holds some favourites, vintage bath salts, miniature perfume bottles, pink glass and china dolls. 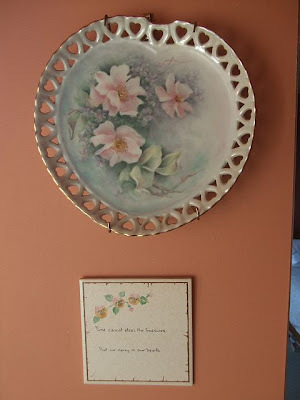 My grandmother painted china and on my bathroom wall are two of her pieces. My favourite item in my bedroom, in fact the whole house, is my vintage print by Italian artist A. Collino. 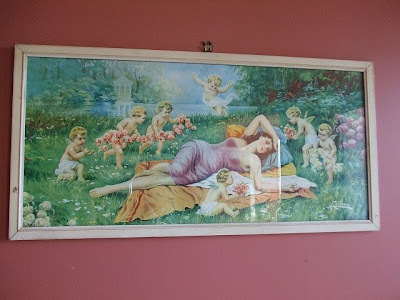 I bought it in a Op Shop in Melbourne during a very bad time in my life and to me it signifies purity in life and a fresh start. I had it in the shop for a while and was offered crazy money for it. To me it is priceless and not for sale! Thank you for visiting me, do pop over to Kari and Kijsa and visit everyone else participating. I hope you visit again . . .